Ted, a stuffy white guy from Illinois working in sales for the Barcelona office of a US corporation, is paid an unexpected visit by his somewhat less stuffy cousin Fred, who is an officer in the US Navy. Over the next few months, both their lives are irrevocably altered by the events which follow Fred's arrival, events which are the trivial stuff of a comedy of manners at first but which gradually grow increasingly dramatic. The least impressive of the three, but in some ways the funniest. Didn't like it at first, but it slowly grew on me, and I felt it really took off in the third act (the opposite of Metropolitan, funnily enough), with some genuinely funny moments (Fred's interpretation of The Graduate is hilarious). Eigemen and Nichols essentially play the same characters from the earlier movie only in a different milieu/circumstances, and yet it somehow works in the movie's favour. The transfer used for the region 4 DVD, on the other hand, is abysmal. I found most of this movie tedious and annoying. The girls were beautiful, but you don't see enough of them. It does have a few interesting cultural aspects and insights about being an American in Spain. I can not recommend this movie. The acting is stiff and frequently uninteresting and boring. Almost a complete misfire as a comedy. This is my favorite Whit Stillman film yet, and I'm not even sure why. Maybe it's because the focus is on two guys instead of a large cast of characters. Something about the familiarity with them makes their antics that much more enjoyable, and the dramatic twist at the end much more powerful. Chris Eigeman is to Whit Stillman as Jack Nance is to David Lynch; that is to say Eigeman is the perfect expression of Stillman's voice. Not quite as funny or as life-affirming as Metropolitan, but the smaller scope (and by that I mean less characters) there's room to devote more time to everybody. In the process, you get a lot more familiar with everyone. This is pretty important because sometimes Stillman's characters can be close to ...annoying? It's a really good movie. I don't know. This was great. Chris eigeman is terrific In this. 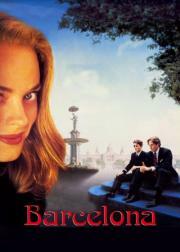 Stillman followed up the success of METROPOLITAN with this romantic comedy set in, as you would assume, Barcelona. Again, his sense of pacing is a bit trying, but he shows much improvement as a director here, aided by John Thomas' lovely cinematography. And his script is no slouch, as naval officer Fred (Chris Eigeman, wonderful) bemoans America's poor standing in Spain, while his cousin Ted (Taylor Nichols, solid) grapples with love and Fred. Points also for a very dark twist (which pays off). Metropolitan was good but Barcelona was great. The relationships between characters felt a lot more meaningful. Whit Stillman has a knack for writing intelligent yet accessible dialogue. Chris Eigeman is also a highly underrated actor. Great for anyone seeking a intelligent yet light film. Taylor Nichols is not a good lead. Now this is my idea of a popcorn movie. Spry and funny dialogue-driven comedy that engages some interesting sociopolitical commentary, but which never distracts or aims to serve as the focal point of the story. This contains what might be the best single scene in Stillman's filmography--Ted's Bible-reading while dancing to Transylvania 6-5,000. In that scene, Stillman's typically wry humor draws attention to the beating heart of the film's central character. The film as a whole is filled with great moments, though it feels a bit more uneven than Stillman's other works. I appreciate the way this one moves forward in time from Metropolitan, observing the society set as they make their way in the world.